For some untold reason or some would say ungodly reason, I have always been enthralled and involved in politics. As a boy growing up in Troy, I was tutored and trained in the rules and rituals of Alabama politics by two masters of my county’s political history. The Probate Judge and State Representative were my mentors. They both had been in politics for decades. Both mentors had taught me a lot of political tidbits over the years. However, when it finally got time for me to make my first foray into the arena, they both sat me down. I could tell that I was going to get some sage advice since both were present. They gave me one of the cardinal rules of politics – you run your own campaign and never ever get involved in other people’s races. They said you should be thankful that they elected you to your office. It made sense that it would be arrogant and presumptuous even if you had been in your post for a while that you should not offer your opinion on other races. In addition, the old adage applies – you make one ingrate and hundreds of enemies. Young Martha Roby learned this old political rule the hard way. As a girl growing up in privilege in Montgomery, she didn’t have the advantage of learning the Rules of Politics. She was probably more interested in planning for debutante balls and learning to play the piano. She went on to college at New York University and majored in music. Another politician that learned a lesson the hard way this year is powerful State Senate President, Del Marsh. There is an old saying and political truism that home folks know you best. Marsh has made no bones about the fact that he was interested in running for U.S. Senator or Governor. His calling card to claiming one of these brass rings was that he had made a lot of money in the private sector and could afford to self-finance a state campaign, if he were inclined to spend some of his money. That remained to be seen. However, in his reelection bid for his Anniston State Senate District, Marsh did use his large state campaign war chest to buy media spots in the Montgomery and Birmingham media market, probably in order to build name identification for a possible 2020 U.S. Senate run. In fact, Marsh spent $482,674 to his unknown opponents $15,435. Marsh got 52 percent and won by an 8,215 to 7,366 difference. Less than 900 votes. Marsh may as well have lost as far as future statewide aspirations are concerned. No PAC’s in Washington are going to take him seriously with that blemish. In 1974, Jere Beasley was running for reelection as Lt. Governor. He had gotten upstartish and antsy to take the reigns as Governor after Governor George Wallace had been shot and was recovering. Perennial candidate, Charles Woods, led Beasley in the first primary and was poised to take him out. Beasley adroitly did his homework. 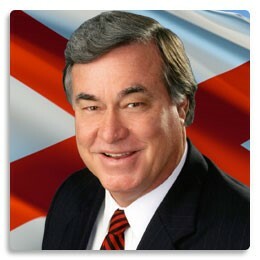 He discovered that Woods had failed to carry his home voting precinct in Dothan. Beasley came back to beat him with a brilliant ad that showed the results of Beasley beating Woods in his own Home Box. The ad simply said, “Home Folks know you best.” The more things change the more they stay the same in good old Alabama politics. Speaking of statewide aspirations, Rebekah Mason and Robert Bentley recently launched a website touting ole Bentley’s history as Governor with a hint that the old boy might get back into politics. Ms. Mason tweeted that she liked my comments about them getting back into politics that I made on Birmingham television. They seem immune to anything they did in the Governor’s office. My thoughts were that I wish they would reenter the political arena. It would be good fodder for me. As you know I like to write about the lighter side of politics and they were colorful and a great soap opera. However, they were no the most colorful in Alabama political history. They are not even close to Big Jim Folsom and Shorty Price.